Giant Screen Films and D3D Cinema are on a mission to educate, with a goal to travel to remote regions and empower and inspire young people in communities affected by a tornado’s destructive power. The mobile experience includes one of the fortified vehicles, advanced weather measurement devices, key personnel from the film, and a staging-grade TITAN dual-lamp 1080p 3D projector from Digital Projection International (DPI). The group brings a nationally-recognized storm-chasing specialist, some of the world’s leading tornado researchers, steel-clad custom weather vehicles and a 10,000-lumen, rugged DPI projector. The project is supported by a National Science Foundation grant, awarded to produce a film titled Tornado Alley. The documentary features filmmaker Sean Casey, star of the television series Storm Chasers, and the researchers of VORTEX2, the most ambitious tornado research mission ever undertaken, in their attempts to collect footage and data from the heart of a tornado. Enlisting a mobile Doppler radar station, a number of custom-built vehicular juggernauts fortified to withstand remarkable winds and debris, and custom-created weather measurement devices, the group patrols the traditional ‘tornado alley’ of the central U.S. in search of the perfect storm. More than simply a thrill-seeking pursuit, the captivating chases depicted in the film are critical attempts to discover the dynamics and the habits of such an extreme weather system—secrets that could improve warnings and save lives. After all, the goal of the film is to help audiences understand and appreciate the nature of severe weather and the work of storm chasing scientists. But in developing the film and its educational outreach, producers at Giant Screen Films realized that there was a distinctly human side to the story that needed further attention. Tornado Alley was produced for and exhibited in large-screen, permanent theaters found in the science centers and museums of metropolitan cities—the exact opposite environments of where tornadoes are actually present. These museum partners have the resources and expertise to build on the film’s content, planning special programs, hosting scientists, and creating meaningful learning experiences. But the project team recognized that the communities most affected by severe weather—and perhaps the best places to inspire future generations of scientists—were largely rural, remote, and lacking informal learning environments like science museums. The production team decided to propose an innovating outreach strategy to the National Science Foundation: using a traveling digital 3D projector, the project would deliver the Tornado Alley experience to communities across the heartland. In late 2011, the NSF-funded Tornado Alley outreach program began visiting remote regions throughout the central U.S. The American Red Cross and FEMA have also helped bring their expertise in safety and preparedness to this program, while other partners including the United Way, Boys and Girls Clubs, and the Missouri Mathematics and Science Coalition have helped identify communities interested in hosting the team. The mobile experience includes one of the fortified vehicles, advanced weather measurement devices, key personnel from the film, and a staging-grade TITAN dual-lamp 1080p 3D projector from Digital Projection International (DPI). During these presentations, an abbreviated version of the 3D film is shown, followed by insight and discussion. “At sites that are underserved or in the process of recovery from a weather event, traditional classroom tools—let alone a film projector—are resources that can’t be taken for granted. In those cases, a 3D film is a special addition to the experience,” said Raksany. Attendees also get hands-on interaction with the mobile Doppler studio and fortified vehicle. Scott Fauteux, senior operations and support manager for D3D Cinema, is tasked with setting up a functional screening environment in every new location, regardless of the environment and lack of resources available. 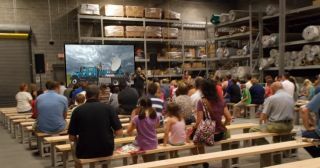 With support from the National Science Foundation and a network of community partners, the project has held events across the heartland, with screenings at a diversity of venues, from schools and community centers to warehouses and home improvement stores.